So, you’ve just purchased some extensions for that gorgeous head of yours and with all of those feelings of happiness and excitement when taking part in something new it’s hard to think of much else. The last thing on your mind would be the things that have to change. When wearing or purchasing extensions you may not always be thinking about what shampoo and conditioner to buy with them because something like that can be easy to forget. However, it is a very important part on your new extensions journey. You want your extensions to last and for that to happen you’ll have to make the switch from that normal, non-professional shampoo and conditioner to ones that will keep your extensions feeling and looking their best. Extensions require special care that not every shampoo and conditioner out there on the market will be able to offer. With extensions you’ll need a gentle touch, not the abrasive and sometimes downright harsh effects of normal shampoo and conditioner. 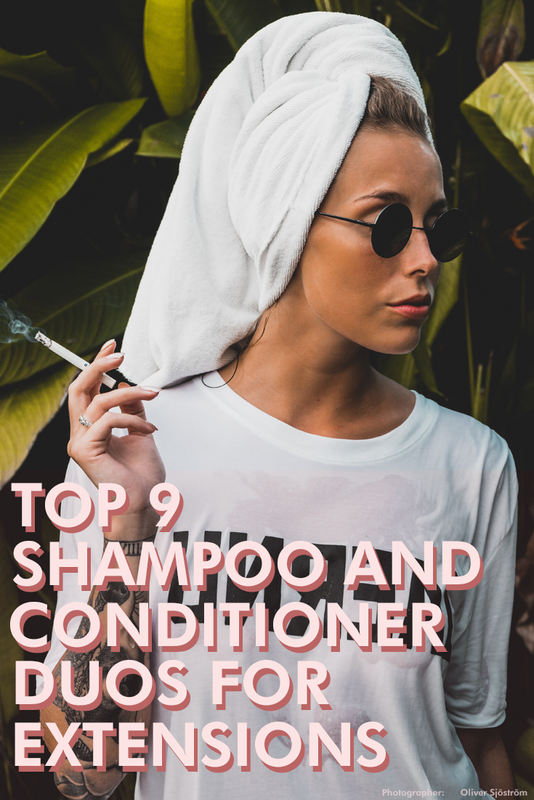 Some shampoos and conditioners out there can leave things in your hair that may damage your extensions and for you to get the maximum amount of enjoyment and use out of your purchase you’ll need to take care of them. The good thing is this- there are plenty of options. This isn’t a new phenomenon and when searching for that new cleaning duo there will be a plethora of products out there that cater to your exact situation. The point of this article is to narrow those choices down a bit and help you make a choice that you’ll be happy with and that will bring you soft, healthy extensions as well! This twin pack of shampoo and conditioner is a professional product that protects, cleans, and uplifts your extensions! This duo is sulfate and sodium sulfate free and it is boasted to be one of the best hair products out there to care for keratin hair. Even if you have color in your hair as well as extensions, there’s no need to worry as this shampoo and conditioner will not strip color. The shampoo and conditioner is made for all hair types and its organic repair system ensures that your hair will be healthy throughout usage. This product will prolong the life of your hair and aids with straightening out those frizzy flyaways as well with its rich formula. Even though this shampoo and conditioner thoroughly removes the dirt and grime from your hair, it is designed to leave those natural oils. This promotes a healthier head of hair and guarantees a light, natural feeling when you run your fingers through it. If you have beautiful colors throughout your hair as well as some extensions, this is the set for you as it is designed with you in mind. Is your hair frizzy or damaged? How about lifeless and dry? If you are not happy with the current state of your hair, this product will change your life. This product includes a shampoo and conditioner set that is 100% all natural and 100% quality with its makeup of pure Moroccan Argan Oil. The Argan Oil is safe for your hair and restores the life within it with its sulfate free vitamin enriched makeup. In no time you’ll have hair that flows smoothly and looks wonderful. Argan Oil shampoo and conditioners are such a great choice as they offer a high content amount of antioxidants, fatty acids, and vitamin E. This helps revitalize not only your hair but your skin as well as you wash it out and it flows down your body. On top of all of these perks, it is a UV protectant and has been used for centuries by the Moroccan population. It works on any type of hair and is guaranteed to moisturize and repair damages naturally without added harmful chemicals. This product has been researched and uses a great herbal recipe that makes it especially great for those with oily hair and colored hair. Looking for a game changer? You’ve found it with this set! Packaged in a simple yet elegant pair of bottles, the RemySoft Hydrating Duo is a wonderful choice for those looking for something neat that smells wonderful. A lot of times when picking out a shampoo, we could care less about what is or isn’t in it because the ultimate deciding factor will almost always come down to smell. Having personally smelled this formula, I can guarantee you’ll fall in love with it just as I have. This shampoo and conditioner is color safe and sulfate free which makes it a great choice for anyone with both extensions and colored hair. They both contain antioxidants that promote hair health and control excessive color fade. It is a silicone based recipe and because of this the shampoo and conditioner will seal every hair shaft and lock in moisture when used which leads to ultimate hydration. This pair is also made in a way that it is UV safe and will block the damage that the sun may cause. Sometimes, we just need something that makes our noses happy and the smell offered with these products is sure to put you and those around you in a trance with its pleasant aroma. This next product is made by the professionals. The professionals are those wonderful hairdressers out there that have a passion for shaping hair and making it the healthiest it can be. They know the ins and the outs of the trade and they know exactly what to mix together to make your hair the healthiest it can be. The Big Kizzy F. A. T. T. (“Full and Thickening Treatment”) Biotin Shampoo and Conditioner is designed by a hairdresser to fully volumize both your natural hair and your extensions. Biotin is a great ingredient and promotes hair growth and reduces hair loss. This is especially great for those with weak, broken hair that may need that extra push to get off the ground. The mixture contains two vitamins that are great for colored hair, weak hair, and extensions- Biotin and ProVitamin B5. This product takes into account the special needs of hair extensions and combines ingredients in a way that will nourish, add shine, restore life, and straighten any type of hair. Those looking for the real deal have come to the right place; this set is hairdresser made and approved! Your next set of shampoo and conditioner can be many things, why not make it LuxeOrganix Moroccan Oil Shampoo and Conditioner? This product is safe for both keratin treated and colored hair and is designed in a way that won’t strip treatment or color with harsh ingredients. This shampoo and conditioner is sulfate free and sodium chloride free which is recommended by professional hair stylists when looking for which shampoo and conditioner set to buy after getting treated. This is especially great for your extensions as it will not harm them in any way, it will promote the shine and health of them! This duo is perfect for any type of hair; curly, frizzy, dry, oily- you name it, it’s perfect for it. LuxeOrganix puts your health and safety first with its paraben free formula. Paraben has been linked to breast cancer and LuxeOrganix doesn’t want you to suffer at the price of your hair, instead it has created a product that will nurture your hair and extensions all while promoting your physical health! With a product as greatly made as this one, it’s hard not to choose it! If you’ve just gotten a keratin treatment or color treatment on top of your extensions, the last thing you’d want to do is reverse the effects of these treatments. With the Finally Hair Sulfate Free Shampoo and Conditioner you can preserve those results and restore dry and damaged hair at the same time. The formula in this product is designed to extensively prolong and protect the effects of keratin treatments so that you may live with your best hair. The shampoo and conditioner is gentle and won’t damage your hair, instead it will encourage health and eliminate frizz with its special moisturizing formula. On top of all of this, the product smells great and is sure to leave you feeling happy and clean afterwards. This product works on all hair types and hair extensions so that no matter what your hair may currently look like or feel like you are guaranteed results. When looking for a new shampoo and conditioner, the choice can be very difficult. With this item, that choice is made much easier. If you’re like most people who have had color treatments, keratin treatments, or have extensions- you may have some damaged hair. Almost everyone suffers from frizzy hair or split ends as well. This shampoo and conditioner set is designed in a way to remedy that and provide keratin or color treatment longevity with its deep conditioning formula. This shampoo and conditioner suds in a way that will not drown you in bubbles and while it cleans deep it won’t remove those natural oils that our hair needs to thrive. If you have bleached or highlighted hair as well as your extensions, this shampoo is great as it will soften those rough strands of hair with its special proteins leaving you with hair that looks and feels great. It locks moisture in the hair shaft which in turn will contribute positively to the health of your hair. You will experience reduced frizz and reduced breakage with this product allowing you to get the full look and enjoyment out of your extensions. Those looking for a shampoo and conditioner that protects extensions will find this product delightful and satisfying. This product is a steal. The Moisturelab Hydrating Cleanser is a great way to keep your extensions lively and healthy! With no sulfate and minimal harmful chemicals, this product is also color treatment safe as well. This products formula was designed to be versatile and is a great choice for any natural hair extensions, wigs, weaves, other hair extensions, and more. It is silicone based which promotes locking in moisture, allowing your extensions to flow freely without fear of becoming dry and brittle. There is also a UV safe component to this formula to protect your extensions from the damaging rays our sun tends to project onto our hair. A great perk about this formula is not only its hydrating cleanse- this product smells amazing. It is enriched with fruit and berry extracts to naturally uplift and promote health in your hair but with that comes its smell. You will just want to close your eyes and breathe deeply whenever you open this bottle with its light, pleasant scent. This product provides great benefits for low cost! Packaged in a lovely pair of bottles, the L Luseta Biotin and Collagen Shampoo and Conditioner is a great choice for those looking for hair growth. Promoting hair growth is difficult and keeping your extensions healthy is even harder. Biotin, also known as vitamin B7, will promote hair health and fortify those strands. The Collagen in this product will renew cells and protect your hair all while giving it a healthy, lively look. The formula is thick yet silky and will thoroughly moisturize your extensions. These items are sulfate and paraben free which is great for your health and this product was not tested on animals. On top of its lovely packaging, this product packs a punch with its wonderful aroma. When washing your extensions, you want to feel your best and when you’re surrounded by this lovely scent you will feel lighter and bubblier. You will feel as though you are a queen when washing and conditioning your extensions with this duo, why not give it a try?